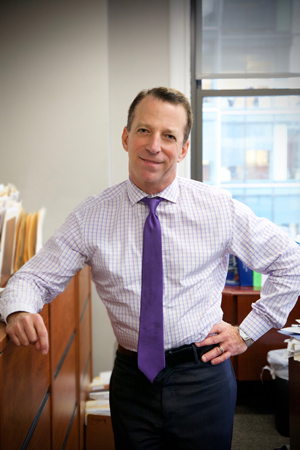 Mr. Weissman is head of the firm’s trusts and estates department. In addition to an extensive background in estate planning and administration, Steven also has substantial experience in family law and issues relating to family formation and parentage establishment. He has formed and advised numerous charitable organizations, ranging from large public charities to small private foundations, and represents a number of small businesses in connection with general corporate and contractual issues. His practice runs the gamut from simple estate plans for single individuals to extraordinarily complex tax-driven planning for families with significant wealth, both inherited and entrepreneurial in nature. Steven also regularly drafts and negotiates premarital agreements, buy-sell agreements, limited liability company operating agreements, and property settlement agreements for couples terminating relationships. Although Steven’s experience is extensive in scope, he has a particular strength in advising and planning for individuals in the creative fields. In his estate planning practice, Steven represents numerous producers, playwrights, composers, directors and performing artists. He also has a particular sensitivity to the dynamics of planning for individuals with non-traditional family structures and members of the LGBT community. Steven has probably done more planning work for individuals who have created families through assisted reproductive technologies than any other attorney in the country. Steven is a member of the New York Bar and the California Bar, with active practices in both the New York City metropolitan area and Los Angeles. Many of his clients, like Steven, are bicoastal, with significant connections to both sides of the country. Steven was a founding member of the national board of the Gay & Lesbian Alliance Against Defamation (“GLAAD”) and serves on the estate planning advisory council for Lambda Legal. He is a member of the New York State Bar Association, the State Bar of California, and the Family Law Institute of the National LGBT Bar Association.